Oklahoma. Everything's going to be OK.
On most slower nights I like to step outside and check i.d.'s. It's usually slow enough inside that there aren't many people to have to watch over. On one slower night, a small group of four or five girls came walking up. I asked them how their night was going and they said it was going great. Then they asked if Vincent was here yet. Vincent is a doorman from a different establishment. He's been coming by on a regular basis. I only know him because he made a point of letting me know where he works. Which at certain times can be annoying but if brought up in conversation is fine. I rarely have conversations with people that are new regulars. Actually, I rarely have conversations with anyone while I'm working. I explained to the girls that I had not seen Vincent as of yet. One of the girls mentioned that they were to meet him here and that they had just left the place he worked. I nodded and said ok and then asked to see their i.d.'s. They all started pulling their i.d. 's out of their wallets and purses. I started checking their i.d. 's and the first four were good. Then I came upon the last girl. Right from the start, as soon as I turned the i.d. and saw the holograms on it I asked for a 2nd form of i.d. Of course she didn't have one so I told her that I'd be holding onto this i.d. until she could provide a second form. Just as the girls were about to start arguing, Vincent walked up. The girl the i.d. came from ran up to Vincent and started talking to him. They stood there for a few minutes and he kept looking over towards me. The girl turned and Vincent walked up to me. "Hey man, she's legit. She's been in my bar all night and I carded her at the door. If you don't want them here just say that." I stood there with a flat face looking Vincent in the eye. "Listen man... I don't know where you learned to check i.d. 's but this is 100% fake. I suggest you learn how to card people. The i.d. is fake and she's not getting it back." Vincent then turns sideways to me and leans over towards me. "Come on man, don't make me look bad. Just let her have it back and we'll go somewhere else." I don't take the liberty of whispering. "If I wanted you to look bad I'd just call your boss and explain to him that your not only letting under age kids into your bar but your trying to bring them into mine. I'm sure he'd appreciate knowing that your putting his liquor license and his business into jeopardy every night you work the door." Vincent stood there staring at me. I added, "She's not getting it back. You might as well leave." 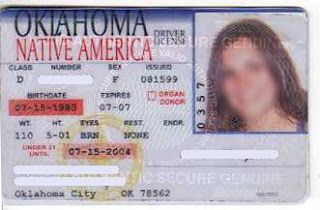 It is rare that we get Oklahoma licenses around here. The main give away that this was a fake was the hologram. You can see parts of the hologram in this copy. 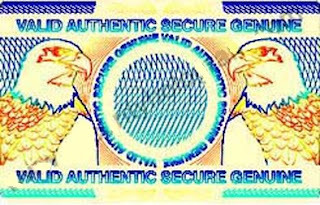 The terms SECURE, GEUINE, VALID, and AUTHENTIC are all visible on this scanned copy of the i.d. I've also added what the entire hologram looks like underneath the scanned copy. The two eagles on the sides weren't very visible in the scanned copy. At least with the hologram picture you can have a better idea of what is visible with the naked eye. Any State i.d. that you come across with this type of hologram is fake. It should be confiscated or cut up right there and then. If your policy is to cut up the fake i.d. 's that you come across make sure that you keep a piece so that they can't just be taped back together.